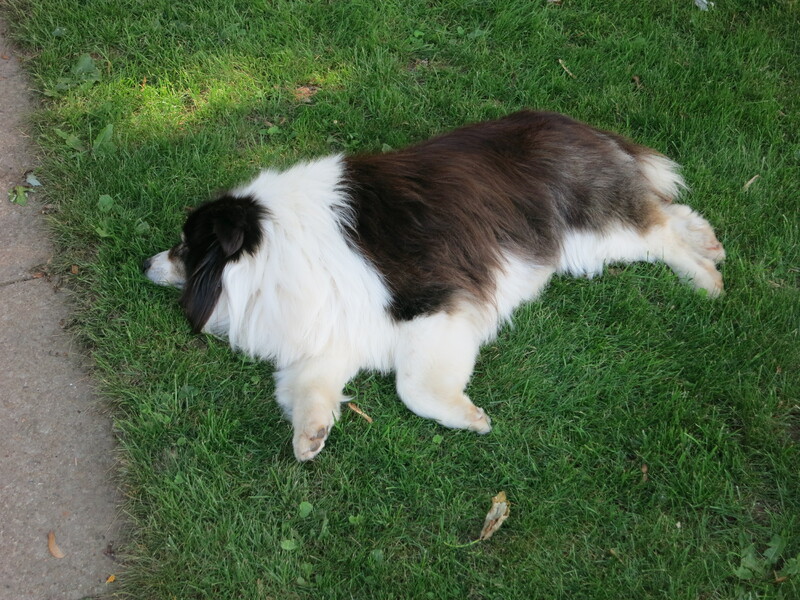 … Weeding is of course, an ongoing task. We’re doing better at keeping up this year, but with all the rains and now the hot, humid weather, it’s a constant war with the weeds! Hot peppers & cucumbers are nicely cleaned but the eggplants are still looking for some attention. Bales are standing by to mulch this area before it explodes with weeds again! While weeding this crop, I found a surprise. Perhaps this will help you identify these mystery plants? … Seeding is also an onging process. Today we seeded a bed of collards & kale, for late summer/fall harvest. 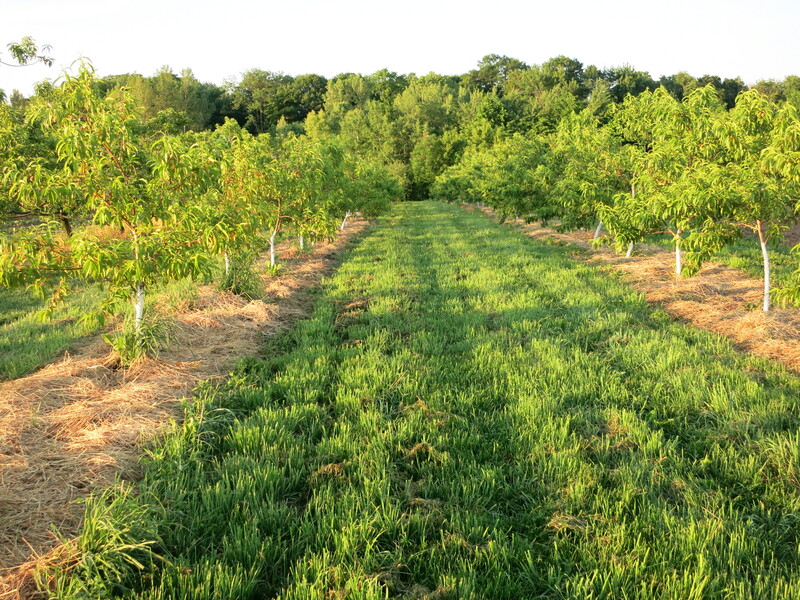 … Thinning is the big orchard job right now. 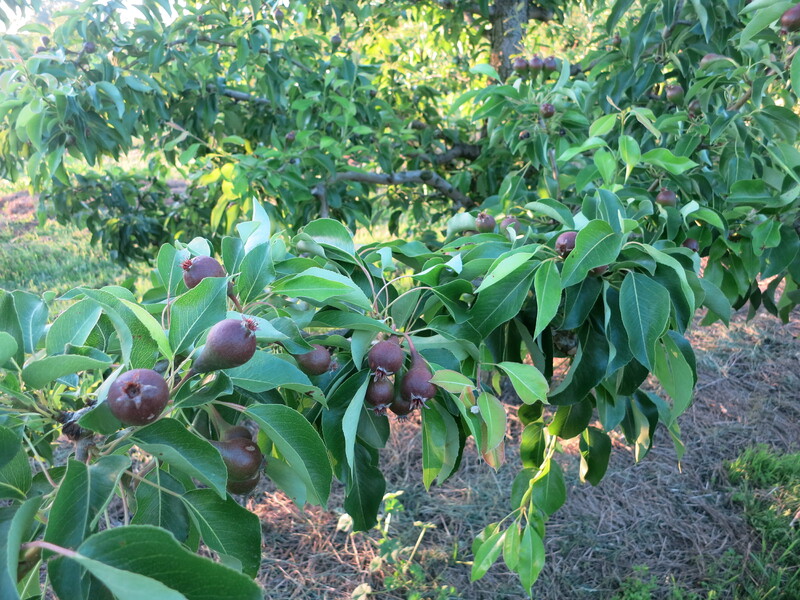 We have completed the pears and have begun to thin peaches. It will take several weeks to complete. 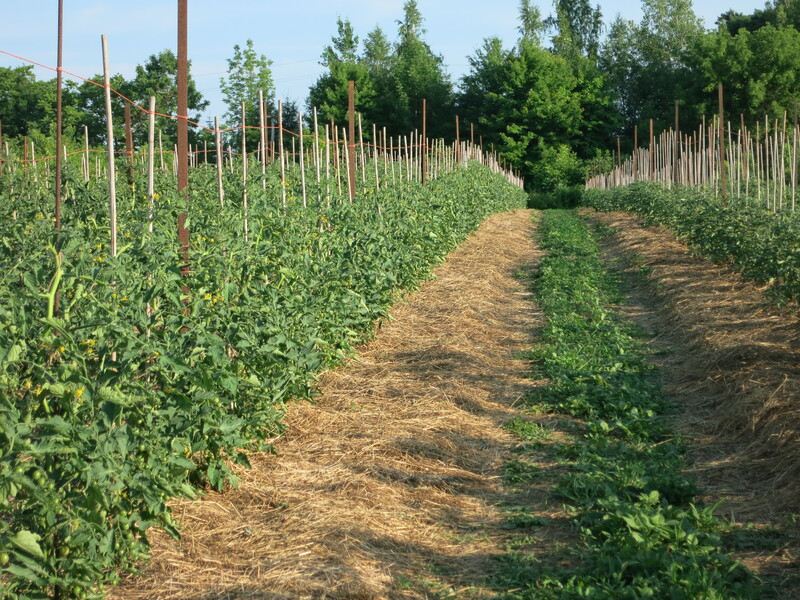 Never look at the ground during thinning time – always look up! 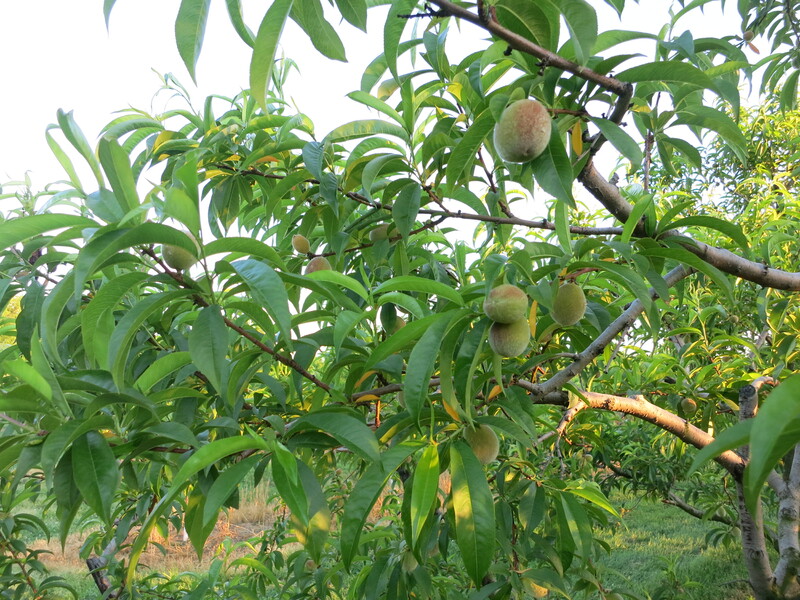 What’s important is how many peaches are on the tree, not how many are on the ground. … Suckering & tying tomatoes always vies for our time against the peach thinning. 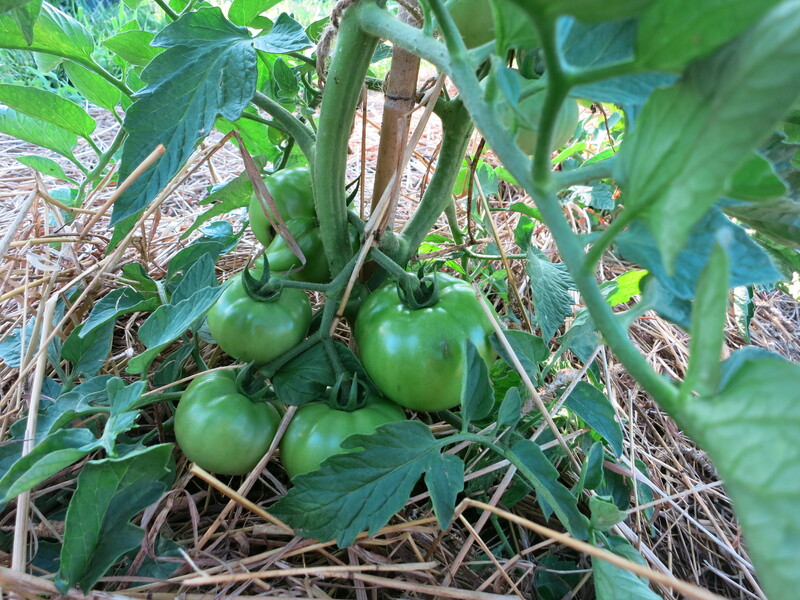 The tomatoes are growing like weeds. We are suckering & tying the plants for the 3rd time already. 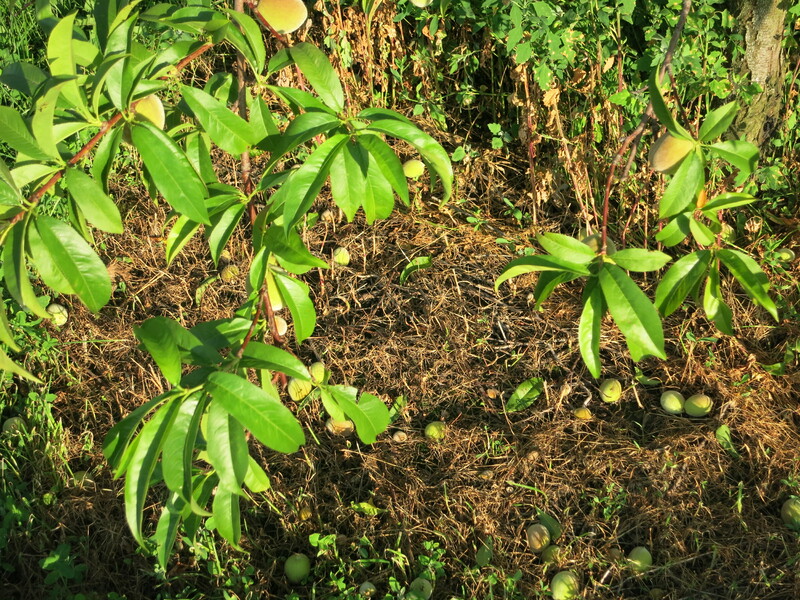 The plants are loaded with fruit. Both the cherry tomatoes & the full size ones. Zucchini, lettuce, arugula, Asian greens, garlic scapes, snowpeas, and maybe broccoli, & salad turnips. 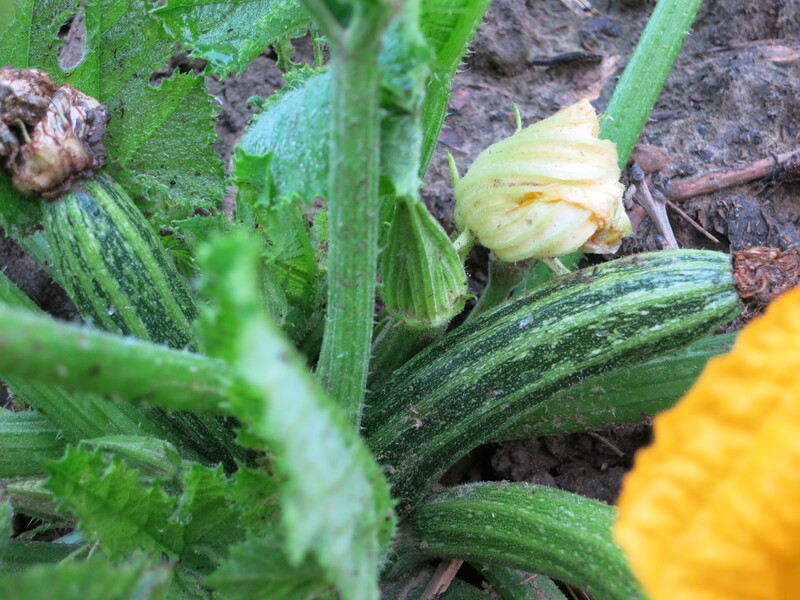 The zucchini is just starting and there should be at least 1 in your share this week. The arugula was grown under row covers to keep the chewing insects at bay – they managed to get in anyways & so your arugula has a bit of a lacy look to it. Still tastes like arugula though! Add it to your lettuce salad for a spicy kick. 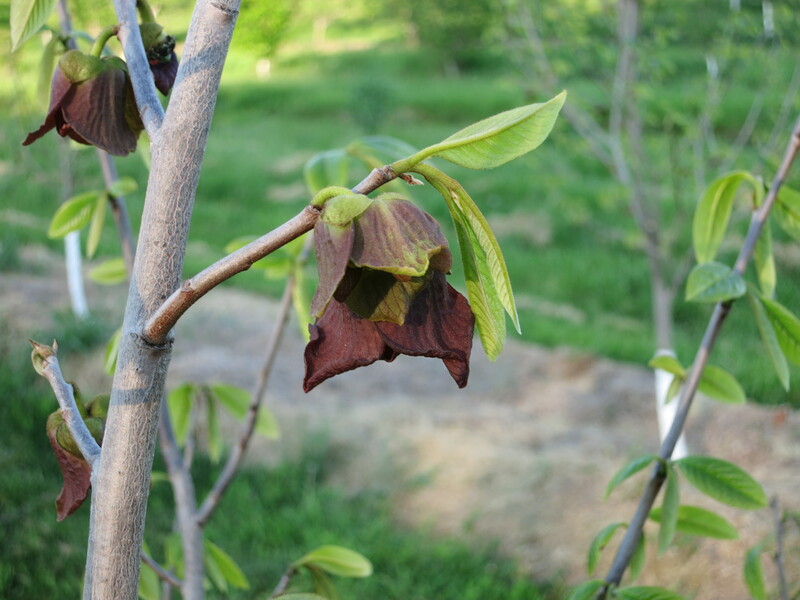 Same goes for the Asian greens – the leaves may have some damage. The snowpeas are still going strong. Remember that they freeze well if you want to save some for later. Simply blanch in boiling water for 2 minutes, then plunge into ice water for another 2 minutes, dry & then freeze in bags. 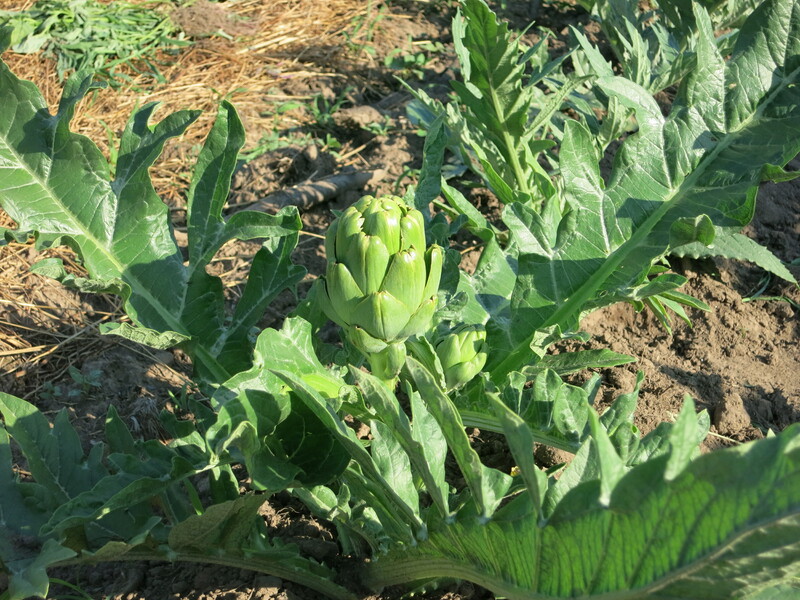 They are great in stir fries later in the summer or next winter. There will be lots of garlics scapes yet, but salad turnips are almost done. 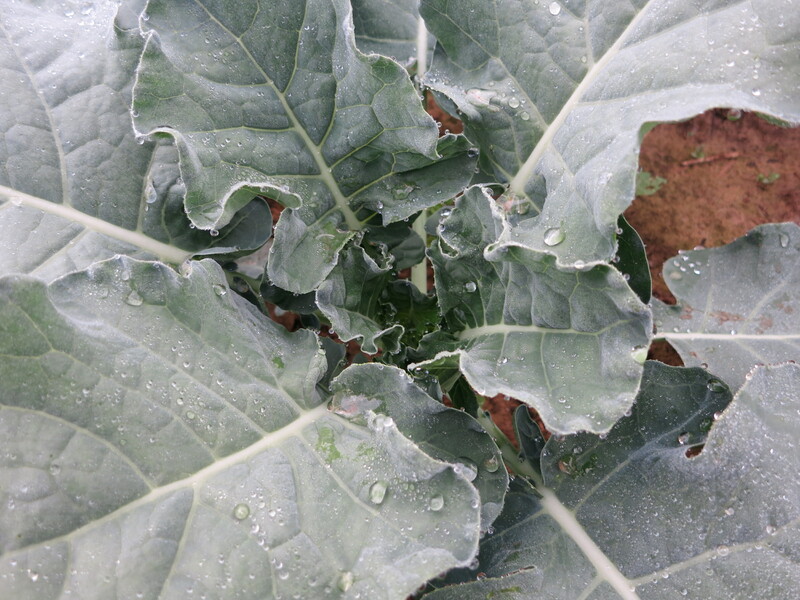 Broccoli is beginning to head – some boxes may have it, some will have to wait until next week. 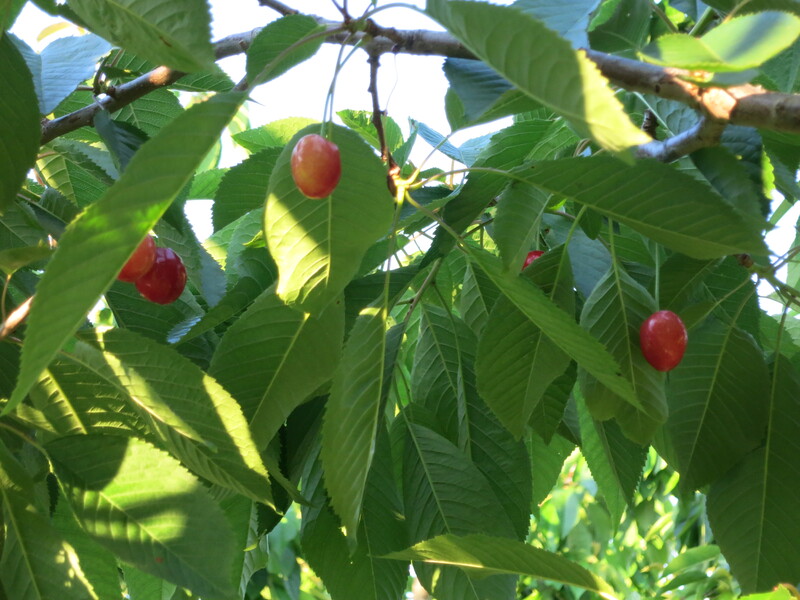 Those shareholders who pick up on Friday are probably beginning to realize that things ripen between Monday and Friday, and sometimes the produce in your box can be a bit different then what we list here. We try to accurately predict what will be ready, but sometimes we are all surprised. Not everyone on the farm was busy today. 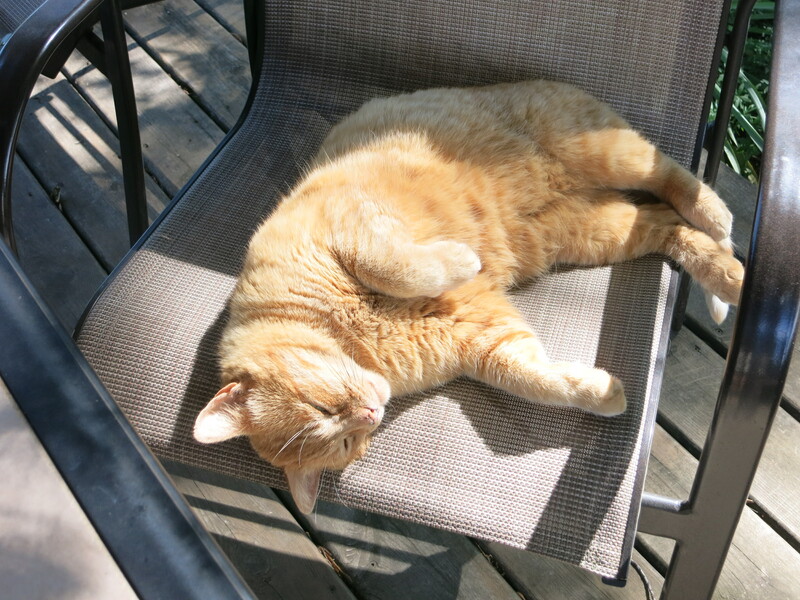 Some recognized that it was a long weekend & enjoyed it in other ways. A young boy ran up to us at market last week and said, “Please sir, can you make the peaches grow any faster?” Than he laughed and scampered away before we could answer. 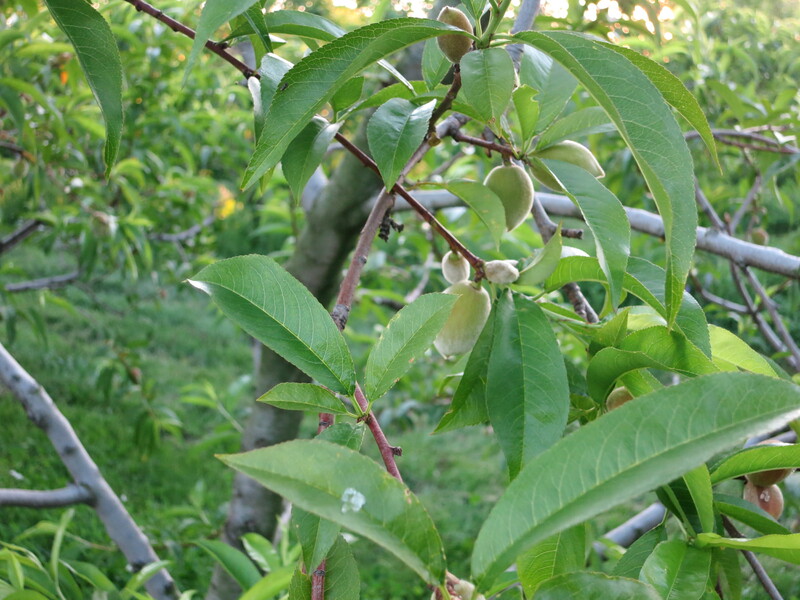 The much desired peaches are beginning to size up. 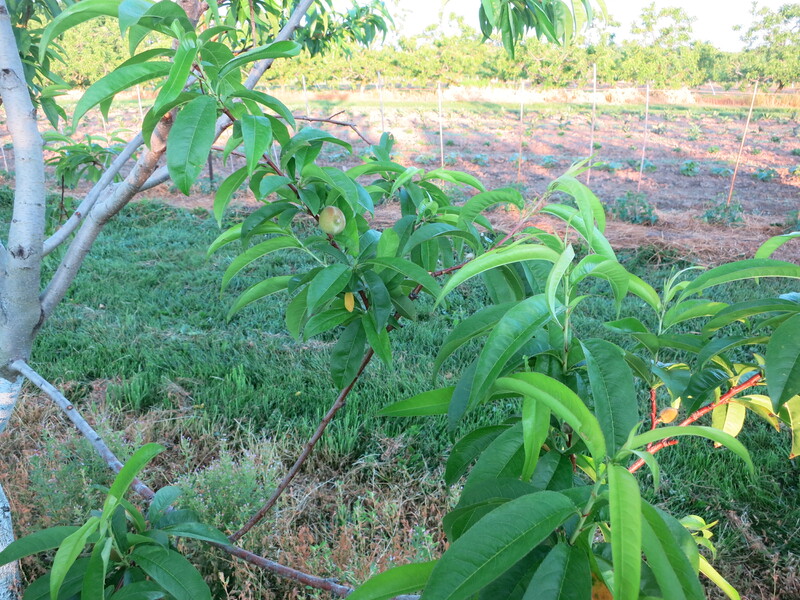 The crop is variable – some varieties are heavy with peaches, while others have very few. We are waiting for the trees to drop the small ones before we begin to thin out the crop to leave just enough for maximum size & quality. 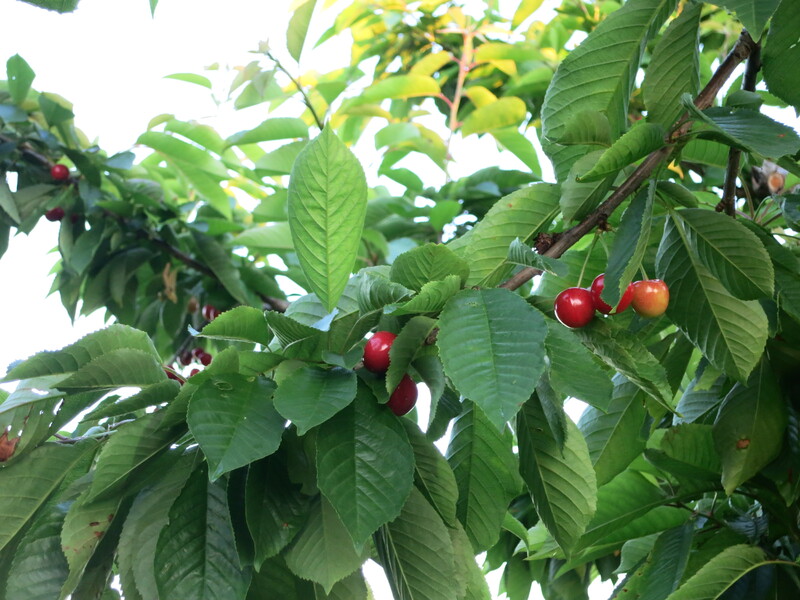 The early cherries are starting to turn colour. The crop is light on most of the early varieties. 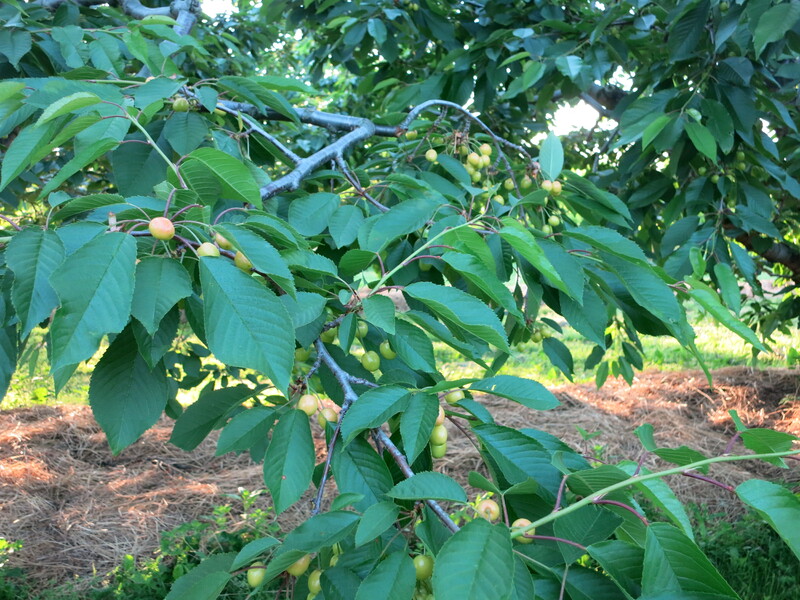 The later kinds have a heavier load of cherries. 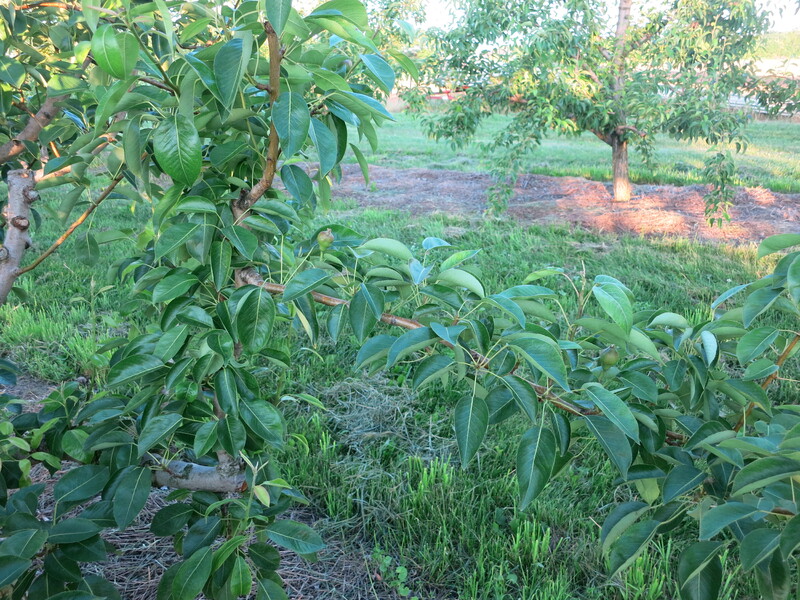 Unfortunately the birds are as anxious to taste fresh fruit as we are, and causing a lot of damage! 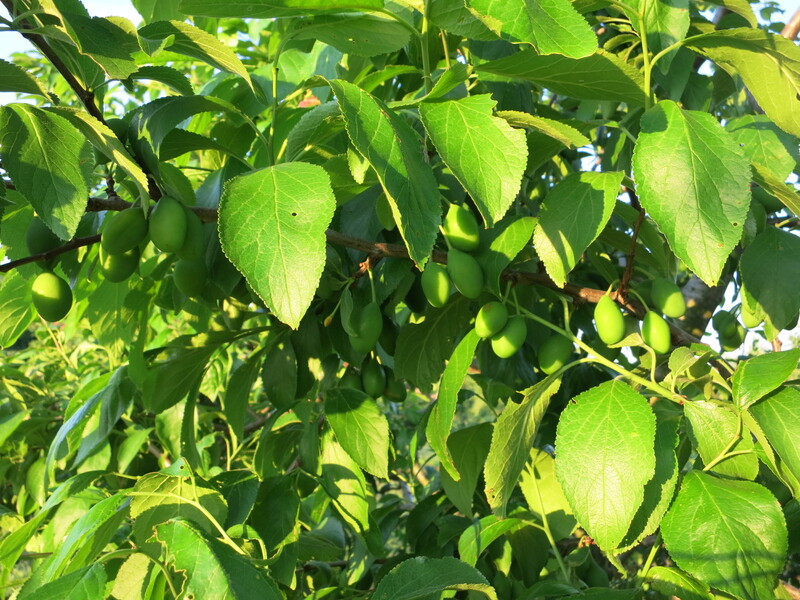 Plums are the same – some have a good crop & others have less. We are satisfied with the fruit crop as a whole. After the incredibly heavy crop last year, followed by the long, harsh winter, we didn’t know what to expect. 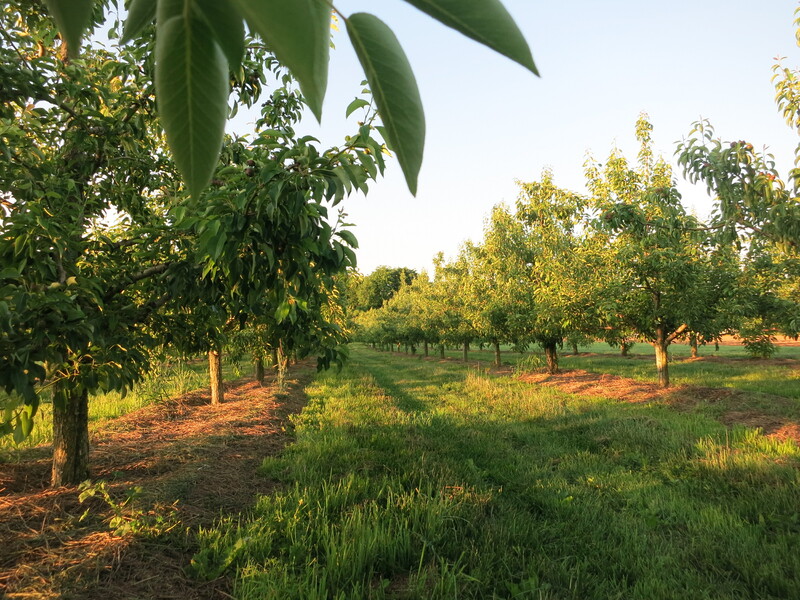 The orchards overall are looking lush & green – enjoying all the rain, & now the sunshine & warmer temperatures. But the fruit is all in the future. Snow peas, garlic scapes, lettuce, salad turnips, radishes. The snow peas are ready! Actually they surprised us and those of you who picked up your box last Friday already got a small taste. They are coming on stronger now so everyone gets a box in your share this week. Enjoy! Garlic scapes are a favourite of garlic lovers. They are the tops of the garlic plant which we cut off so the energy is put into sizing up the underground bulb. Use the whole thing. They are slightly milder than garlic bulbs, but with lots of good garlic flavour. 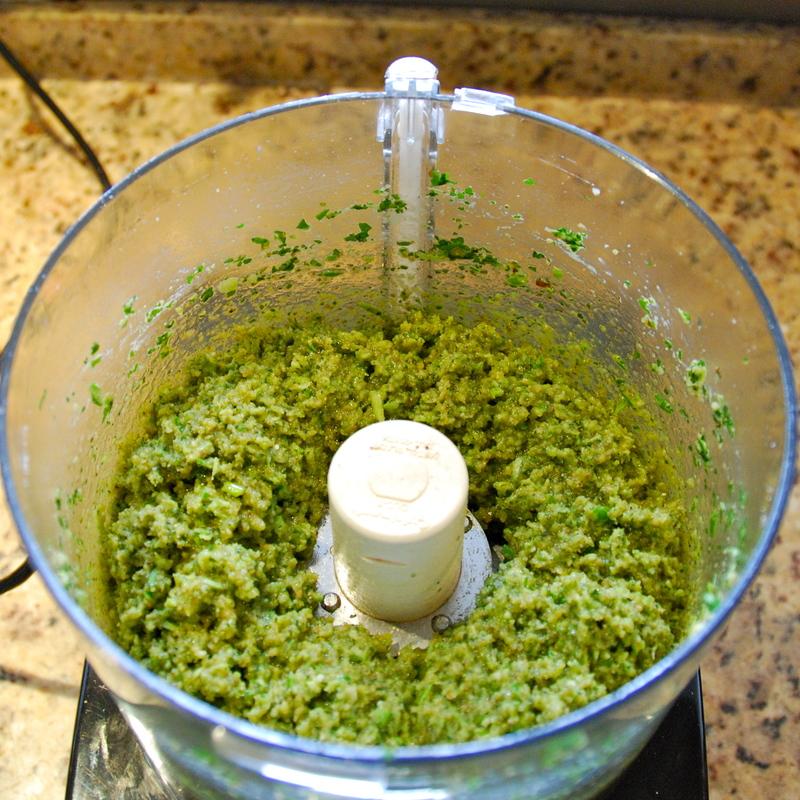 Many people enjoy garlic scape pesto, so I have included 2 recipes. The 1st is an easy basic pesto recipe, while the 2nd includes spinach & several more ingredients. It comes from one of our CSA’ers last season. The lettuce this week is a loose head – either green or red. 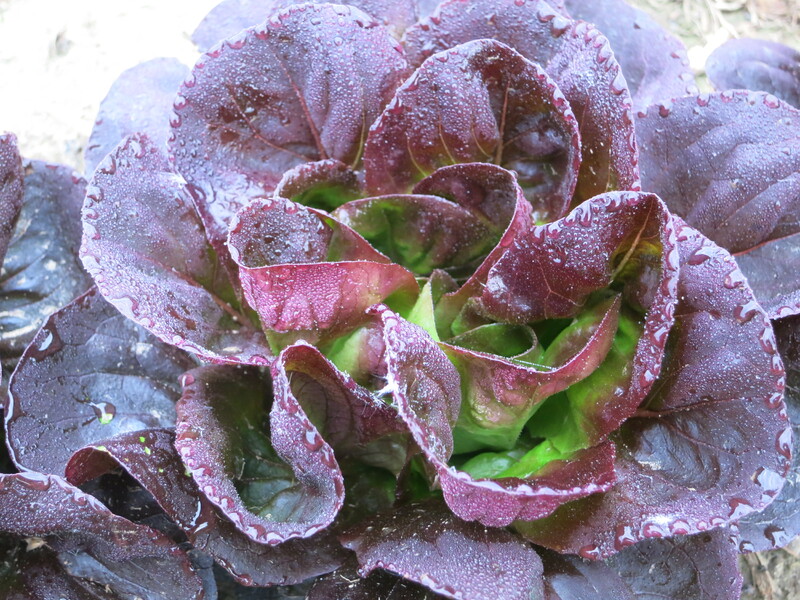 This is a brand new kind of lettuce that looks beautiful (we posted pictures of it last week on the blog), grows vigorously and is supposed to taste great! But you can be the judge of that. Please let us know what you think of this lettuce. Tell us how you enjoyed the salad turnips last week. We love them & eat them daily – maybe because they require no special preparation. We just pick them, wipe them clean & eat! The radishes are soon coming to an end. The warmer weather means they will taste a little stronger. Directions: Process until smooth. While motor is running, drizzle in oil. Makes 2 cups. Salad turnips, lettuce mix, radishes, spinach (probably!). Salad turnips are small, round, white turnips that resemble radishes – but without the bite. Mild in flavour, crisp, and quite tender, they are best eaten raw – simply wash, cut off the tops and enjoy! They can also be stir fried, sautéed, or steamed – both the turnips & the green tops. 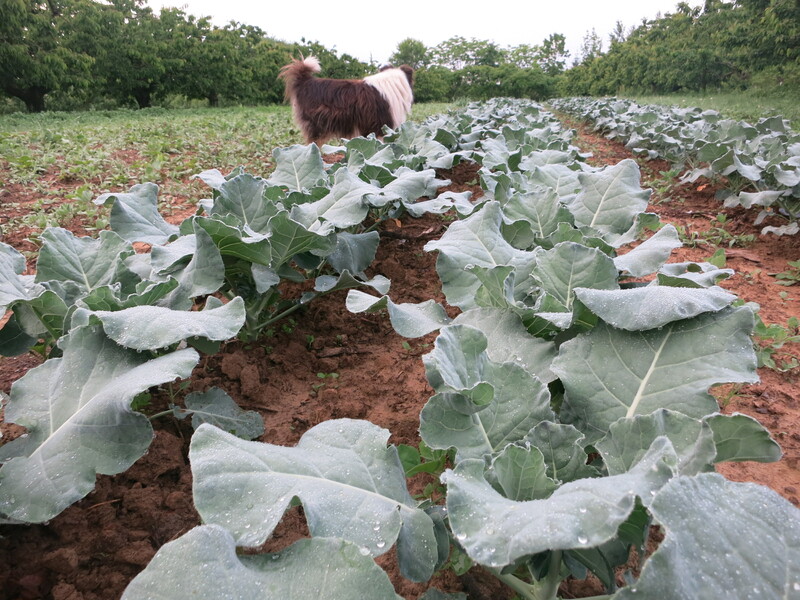 The lettuce & radishes continue – thay are loving this cooler weather & all the moisture. 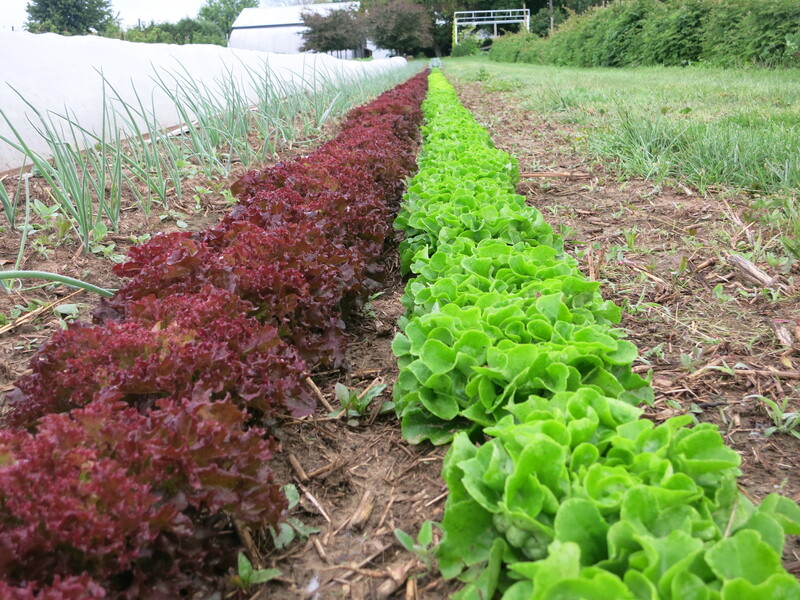 Remember that the lettuce has been rinsed once to remove some of the field soil. You will want to wash it again. The first spinach patch is about finished. There should be spinach in Tuesday’s box. The next spinach planting is coming slowly. There may be some ready for Friday’s box, or maybe not. 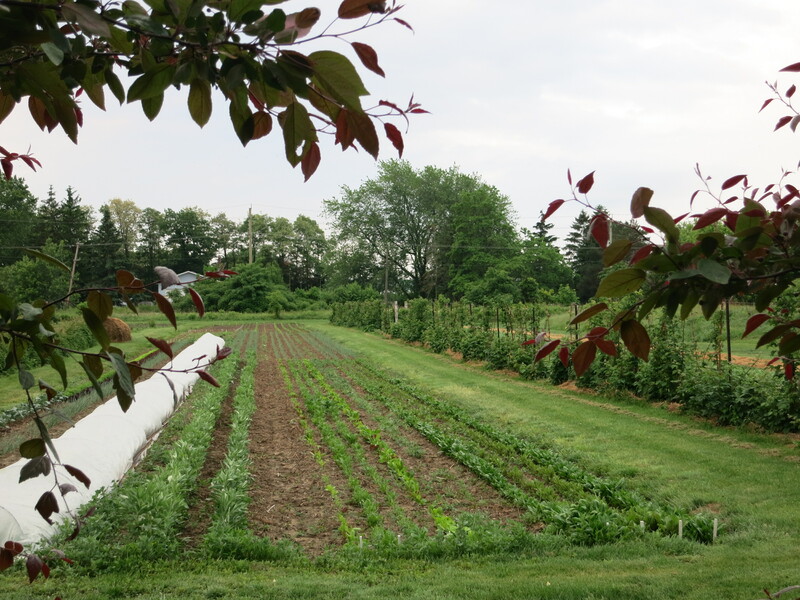 Long-time shareholders are looking for snow peas, broccoli, even raspberries. 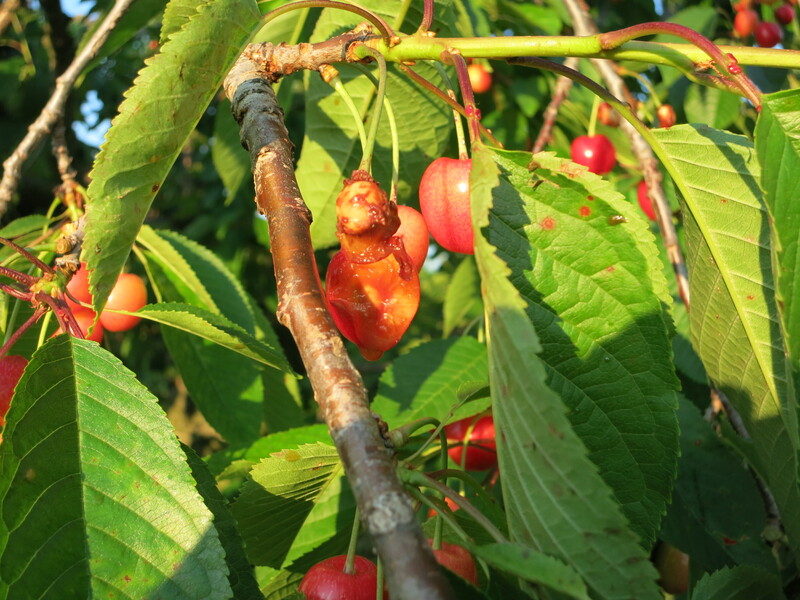 Often we are picking these vegetables and berries by now – but not this year. 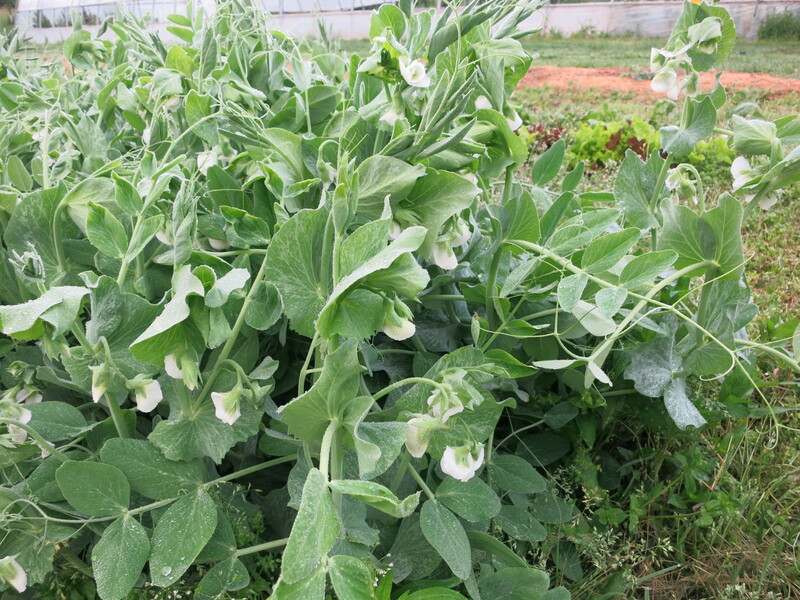 The snow peas are finally blooming – all 3 plantings! That means peas in a couple of weeks – lots of peas. 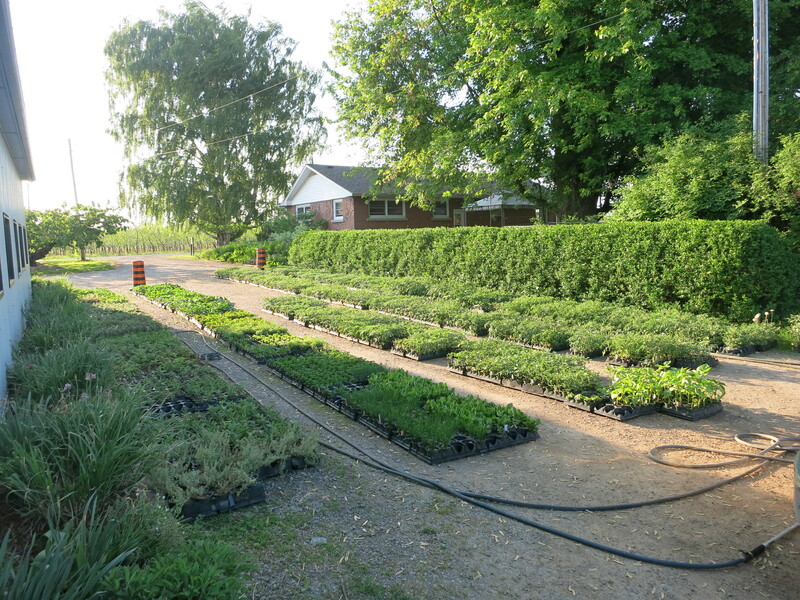 We try to space the 3 plantings out so they mature in sequence and provide a longer harvest. But this year Mother Nature has fooled us & they are blooming together. 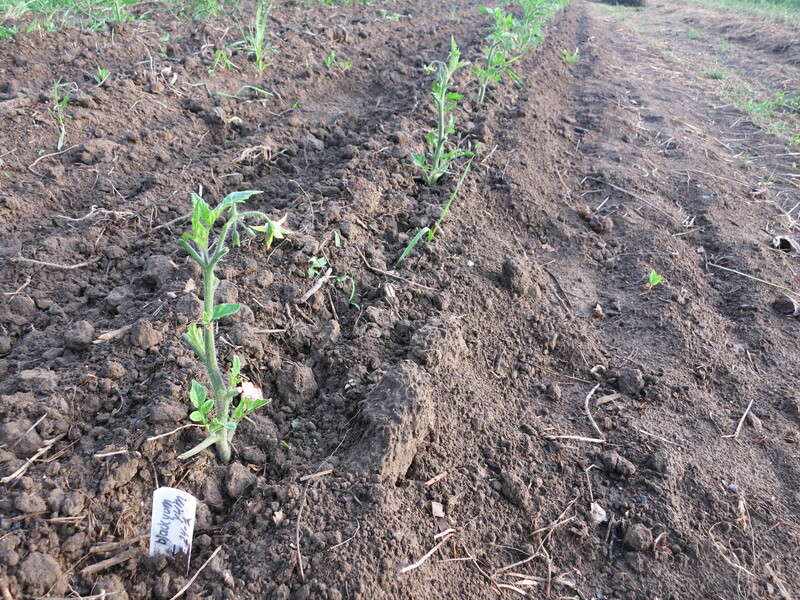 The result may be lots of snow peas all at once – we’ll find out shortly. The broccoli is growing daily – but so far no sign of heads. 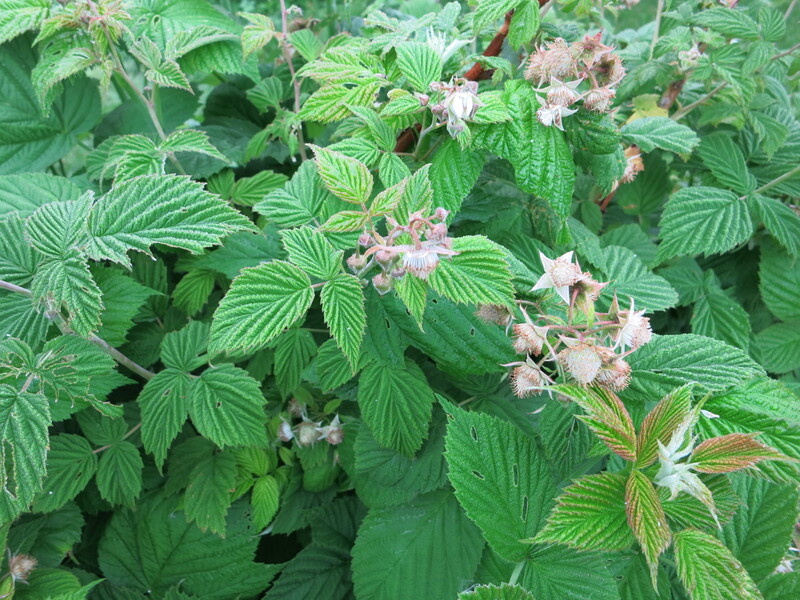 Raspberries are forming – we’re anxiously waiting for the first signs of pink! 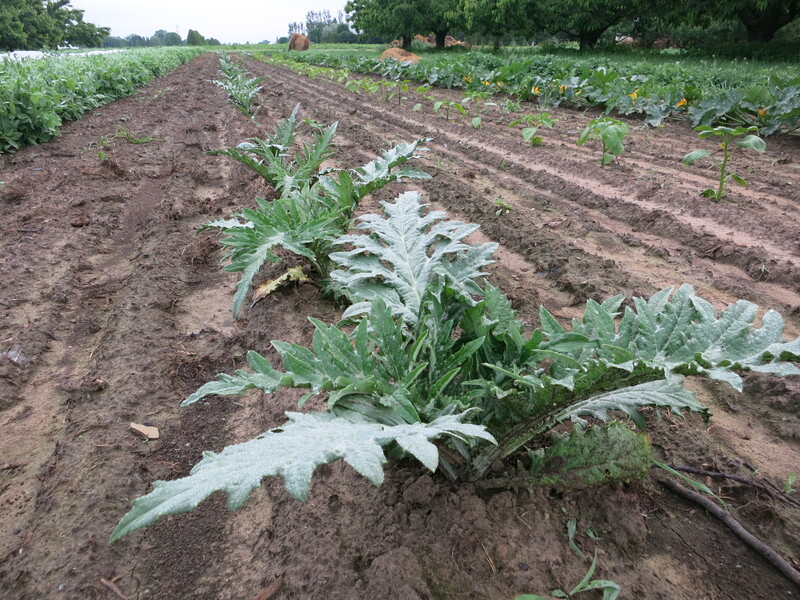 Here’s an update on some of our other vegetable crops … (we’ll provide a fruit update next week). So far we’re (almost) keeping up with the weeding! 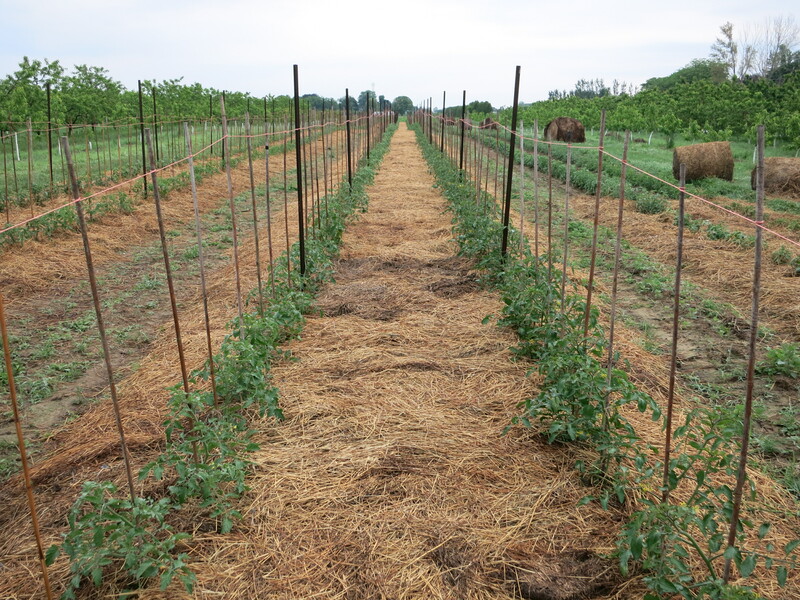 Most of the tomatoes are mulched, staked & tied now. 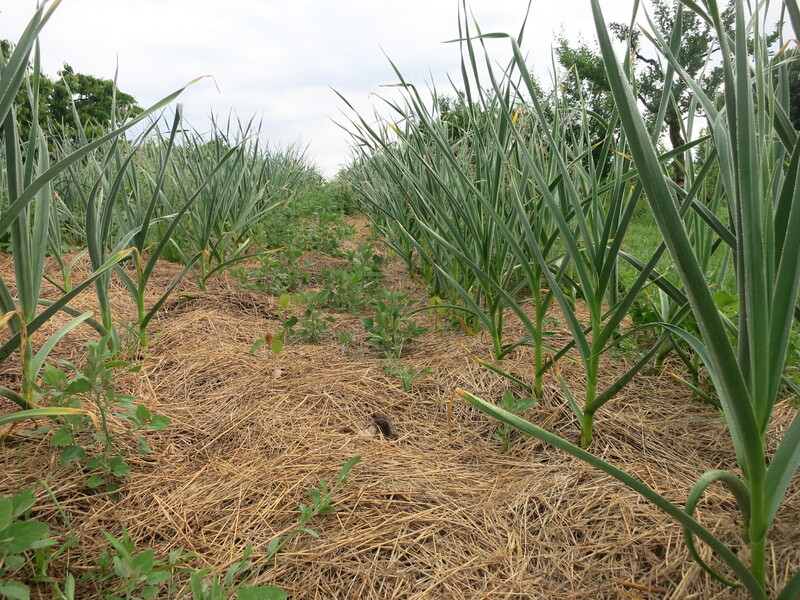 Garlic – expect green garlic & scapes in your CSA box soon. The recent downpours have left the eggplant & peppers dirty. 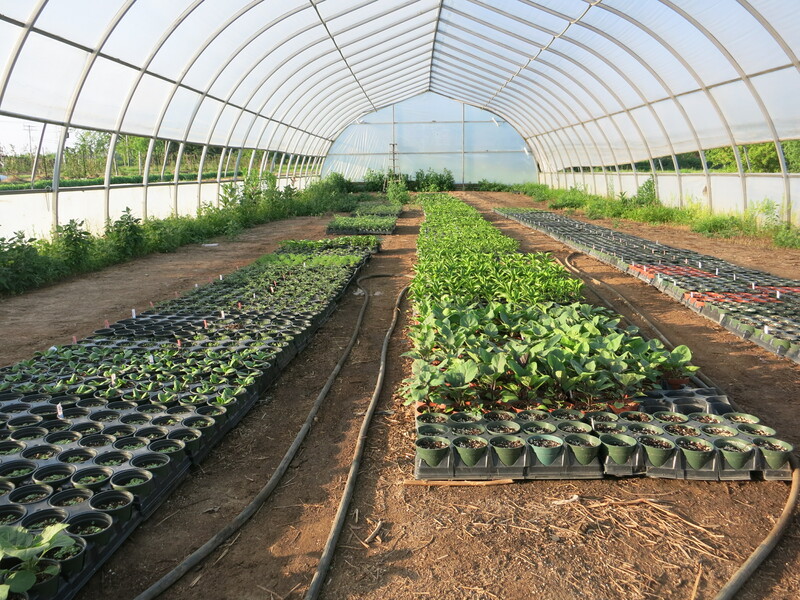 We’ll cultivate them a few times to encourage quicker growth, then mulch them. Some amazingly colourful (and hopefully tasty) lettuces are almost ready to pick! 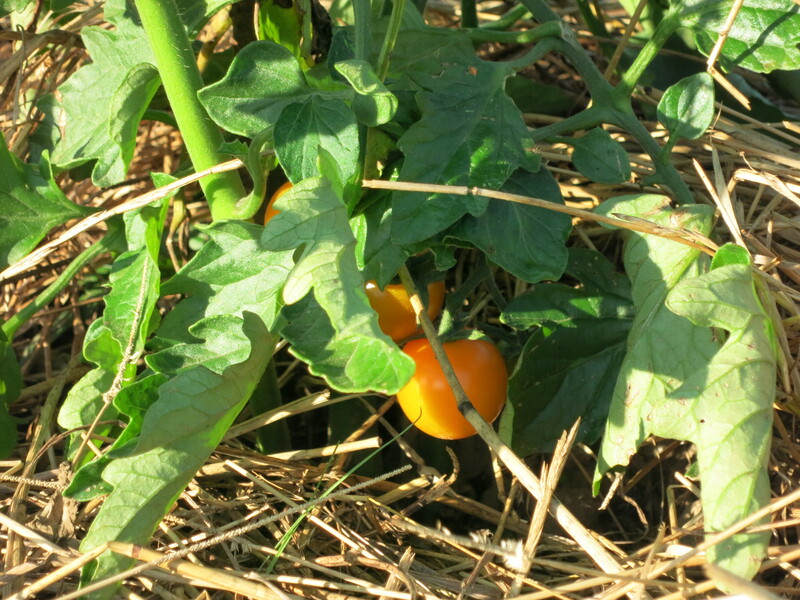 … and our mystery crop – growing well too! One of the things I like about farming next to the railway tracks is all the wildlife we see there – rabbits, groundhogs, mice, muskrats, sometimes skunks, all sorts of birds, & occasionally deer and coyotes. One of the things I don’t like about farming next to the railway tracks is all the wildlife we see there – and the damage they cause. The other day a family of very young groundhogs scurried into the underbrush as we came by. We were able to count 3 little ones before they disappeared. Unfortunately their home happens to be just opposite our newly planted tomato patch. They have been tasting the various tomatoes. Discerning little creatures that they are, they tried and rejected Peron Sprayless, as well as Red Pearl, Green Tiger & even the always popular Sungold tomatoes. Their favourite was Black Yum Yum (obviously well named), a new to us heirloom. 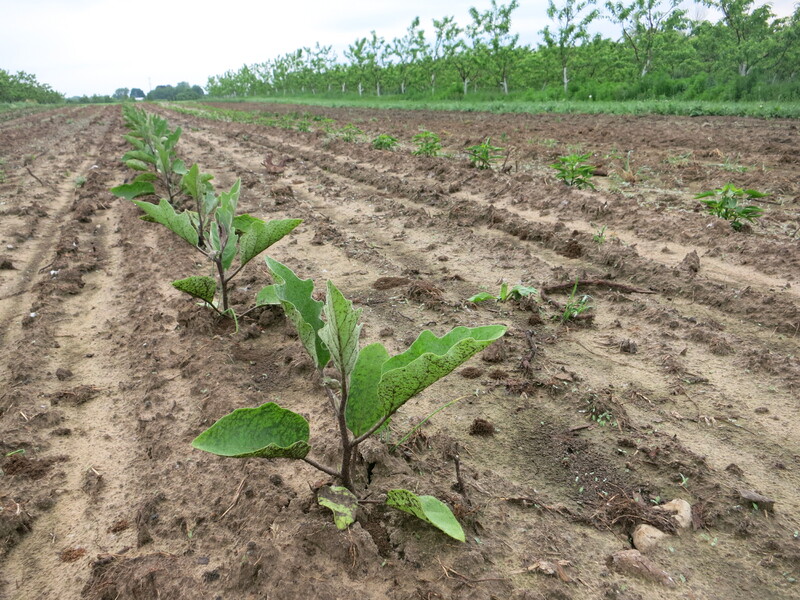 However, the plants are trying to keep on growing and we may still be picking Black Yum Yums if the groundhogs move on to something else – perhaps eggplant or sweet peppers or cucumbers? Growing conditions have been great this past week, with plenty of sunshine & some rain as well. The nights continue to be on the cool side. These are all things that plants & trees like! 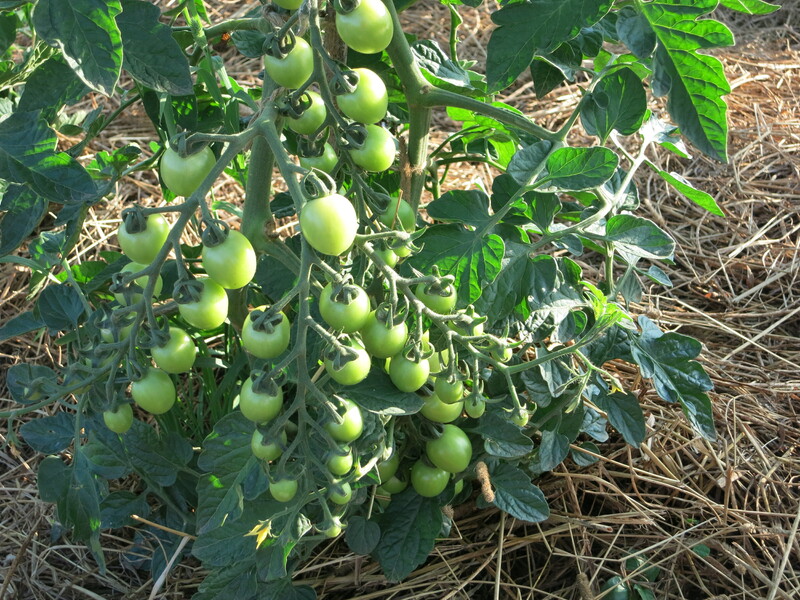 (more herb & tomato plants are also available). 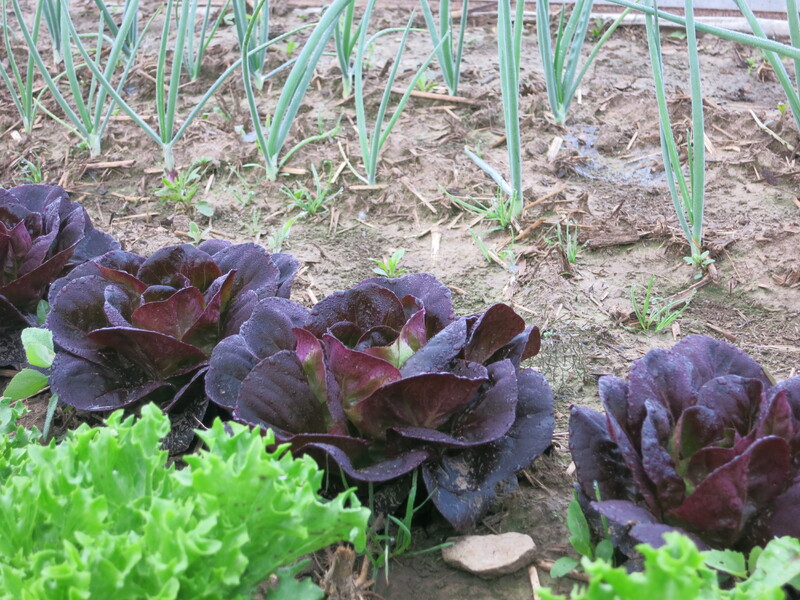 The lettuce is finally ready – a nice mix of colours that are beautiful in a salad. The peas shoots are for cutting and adding to your salads or sandwiches. Place them outside in the sun, keep well watered and they should last another week or more. If you cut them down only about half way or so, most will regrow enough for a 2nd cutting. Spinach & radishes continue… Here are 2 recipes for radishes you may want to try. Place radishes in a roasting pan. Drizzle with olive oil and scatter butter pieces over. Strip thyme leaves off stems and sprinkle over the radishes. Season with salt and give everything a good toss. Roast for 15 to 20 minutes, or until radishes are wrinkly. If your radishes are small or skinny, watch them carefully, so as not to overcook them. Midway through cooking, give the pan a shake. Let cool slightly. Slice radishes into fat rounds. Place on a serving dish, drizzle with olive oil and dress with thin slices of butter. Sprinkle generously with sea salt and, if you like, some black pepper, too. Scatter red onion slices over the radishes. Serve with crumbled blue cheese or with hunks of crusty baguette and additional butter, salt and thyme. Heat oven to 400 degrees. In a large mixing bowl, combine potatoes, olive oil, salt and pepper. Empty potatoes onto a foil lined baking sheet, and place in the oven. Cook for about 20 minutes. In the same mixing bowl, toss the radishes in olive oil, salt and pepper. Empty into an oven-safe saute pan, or another foil lined baking sheet, and pop into the oven for about 10 minutes, or until radishes are softened. As the potatoes and radishes are roasting, mix together your dill sour cream sauce in a large mixing bowl. Remove the potatoes and radishes from the oven and let cool. Once cooled, combine the roasted vegetables, fresh onion and 1 cup of the dill sauce. Let cool in a refrigerator and serve on a nice spring day! 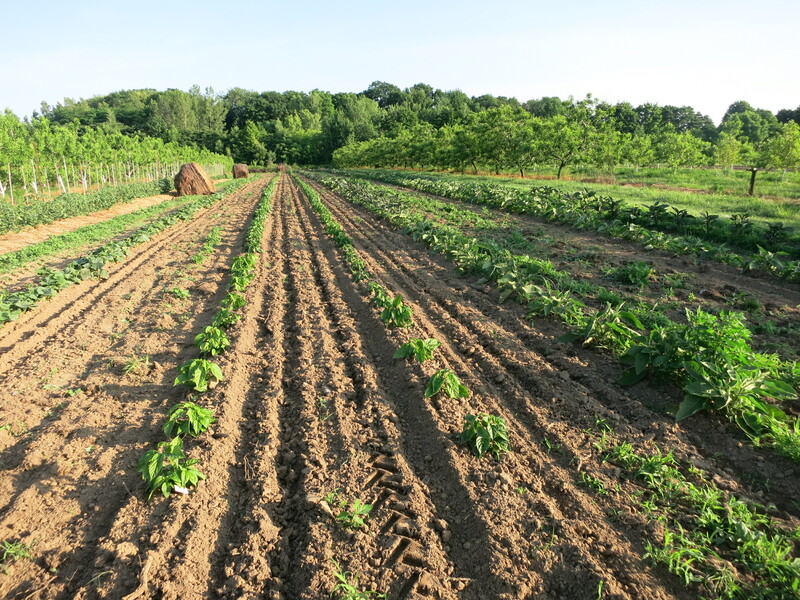 Our CSA program begins this week. Our last farmers’ market also kicks in – now we are doing all 3 each week. The marketing season has officially begun for us! zucchini, cucumbers, kale, broccoli, peppers – sweet & hot, and eggplant. But our CSA members are looking for something to eat! so … what’s in the box? Radishes, spinach, Asian greens, plants – herb & tomato, frozen blackberries. We have a lot of radishes in the ground – many colours & shapes & sizes. This is not just to make things interesting, but to learn what we can grow, & grow well. We actually don’t have a lot of experience with radishes, so it will be exciting to see how they turn out. 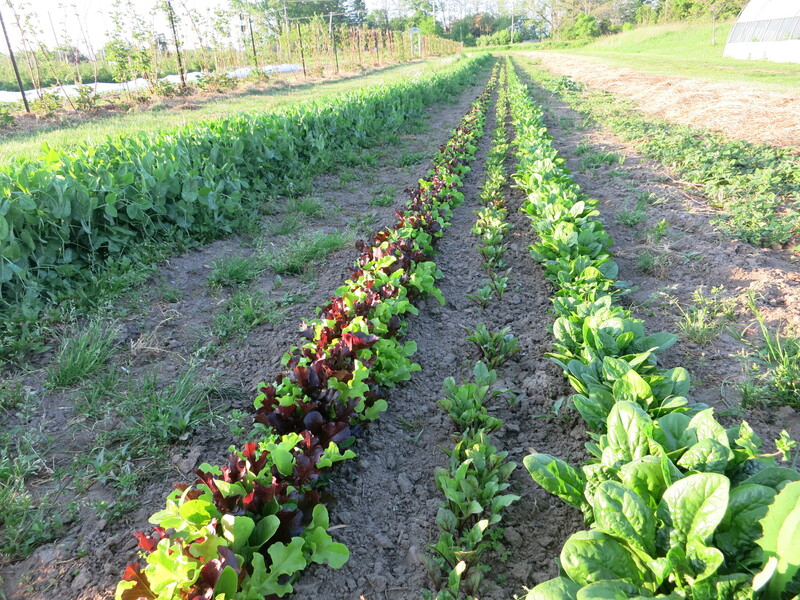 The spinach & Asian greens – mizuna, tatsoi … are looking good and should taste great in a salad! 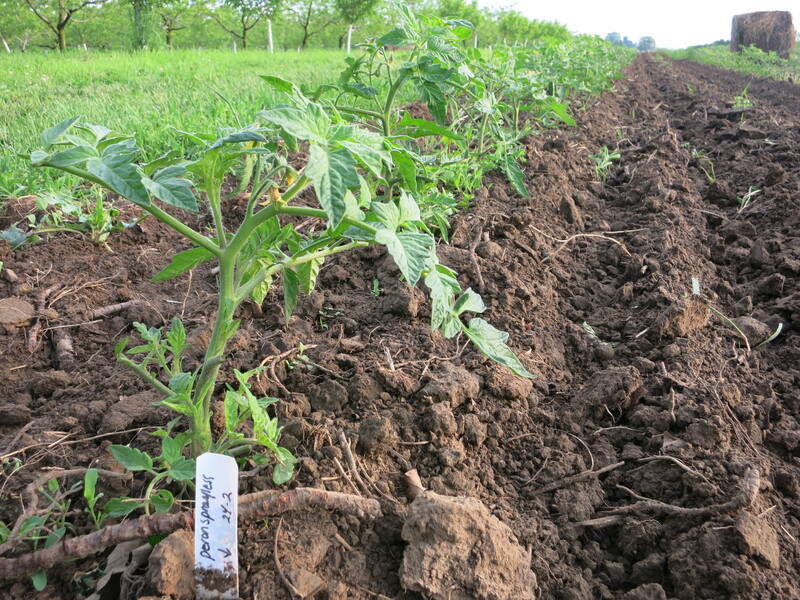 Herb & tomato plants will be available – your choice. Plant them for later, or just eat them now (the herbs that is). Remember all those fabulously delicious blackberries last season? We hid some away in the freezer then, for you to enjoy now – in smoothies, on yogurt, mixed with other fruit … or how about with the spinach in that salad. 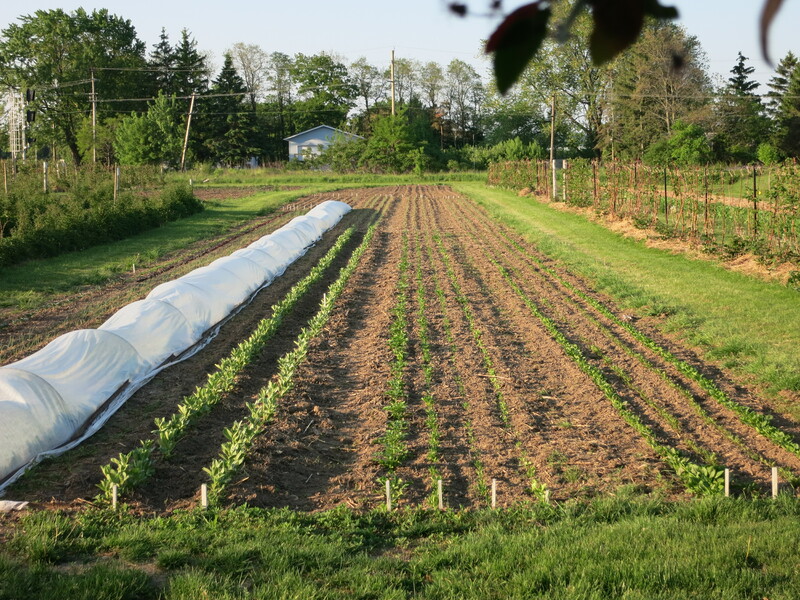 The Asian greens & radishes are tucked away under the white row covers – both to keep them warmer so they grow faster, and to protect them from bugs. Lorie won’t know until she starts to pick tomorrow how much will be in your box. The spinach is looking good & ready to harvest. 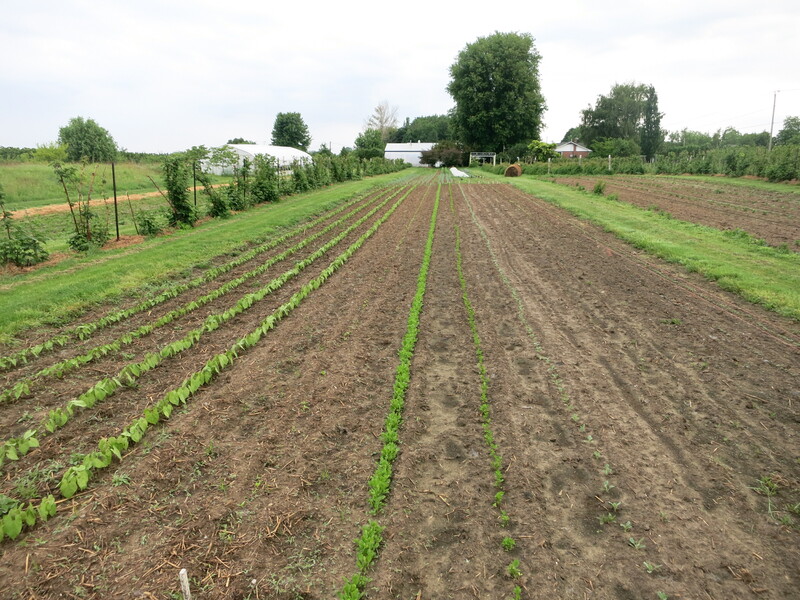 Lettuce is still a week away and the snow peas on the right have not yet bloomed, so look for them in a few weeks. … and the driveway remains full. 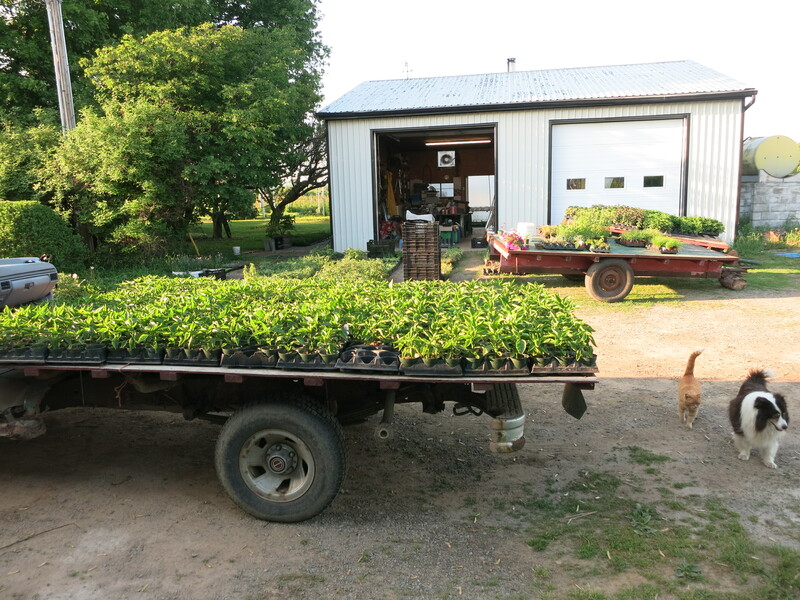 A load of sweet peppers that went into the ground today. 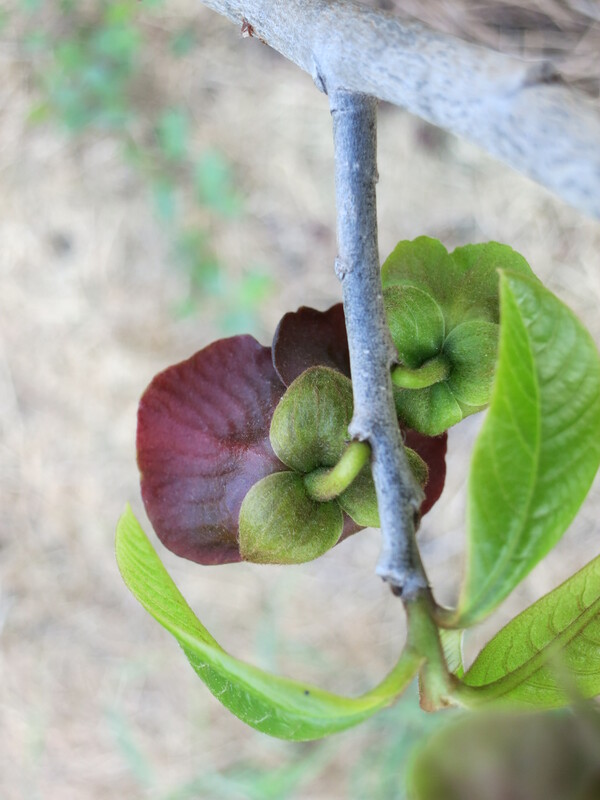 Here are the final fruit blossoms of the season. Paw paw blossoms are beautiful & unique! Looking forward to seeing everyone this week – at the farmers’ markets and at CSA pick up.